HK 416A5 – chocolatey smooth. Above is the HK 416A5, which is H&K’s entry into the US Army’s Individual Carbine competition. For those of you that don’t know, the Individual Carbine competition aims to find the successor to the M4/M16; notable entries include a new version of the FN SCAR (called the FNAC), a version of Remington’s ACR (known to most airsofters as the Masada), and now H&K’s entry above. It’ll likely be a year or two before we start seeing airsoft replicas of the above…. but it’s a nice glimpse into the future. 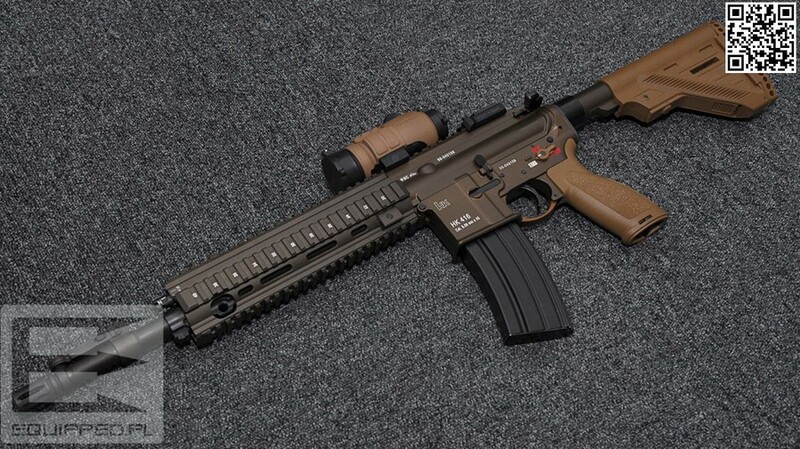 I’m not exactly a fan of the shade of FDE they used on the stock and pistol grip – it looks like they’re made of chocolate, in my honest opinion. But oh well, 416s are cool, so I suppose this is cool too. This entry was posted on Wednesday, October 17th, 2012 at 10:00 PM	and posted in Guns. You can follow any responses to this entry through the RSS 2.0 feed.